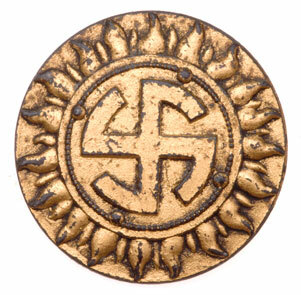 NSDAP Pagan Sonnenwende Tinnie: Numerous nsdap units celebrated the pre Christian pagan German Sun worship holidays. This one is unidentified as to year, town, or collection drive. 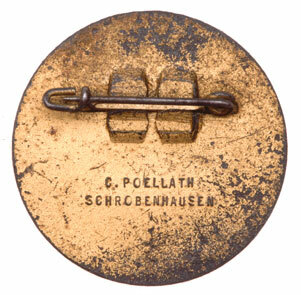 Fine Zinc, gold finish, crimped steel pin, C. Poellath Schrobenhausen, moderate wear.